It means that where ever you might use a Raspberry Pi 3 you can also use a Pi 3+. In almost all respects that matter it is a drop in replacement but with its BCM2837 ARMv8 Quad Core CPU cranked up to 1.4GHz and much faster more flexible networking it's likely a better choice. To this end we have been testing this new "slice of Pi" for more than month to discover all the nooks and crannies and we're very impressed with the improvements the Raspberry Pi team have managed to pack in. 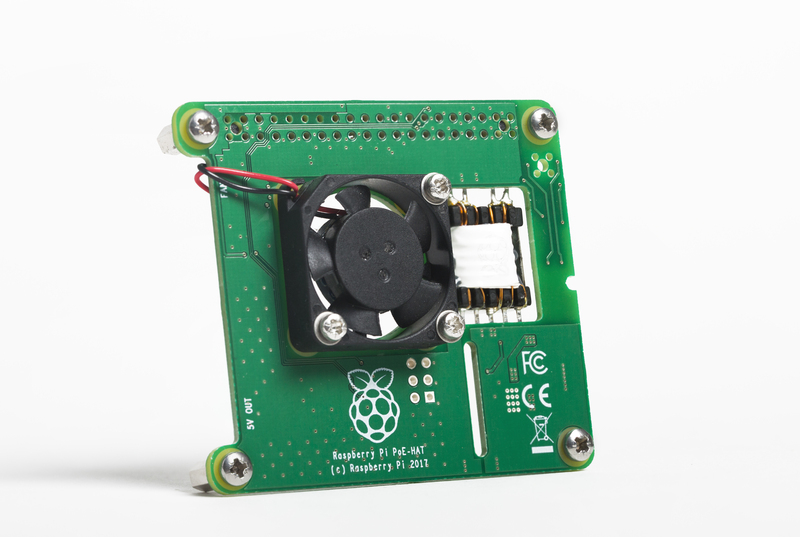 Of course we used BitScope Blade to power and mount these new Raspberry Pi, just like we do for every Pi! Here are two Raspberry Pi 3+ powered and mounted on Blade Duo and six Raspberry Pi 3 on Blade Quattro and Duo in the background. They are configured as PXE client/server pair in this case with connection between them via a short ethernet patch cable and powered from the same 24V supply that powers the six Raspberry Pi 3 behind them. We connected to the server RPi3+ on the left via WiFi and used it to boot the client RPi3+ on the right and we were able to test most of the features of interest to us this way. However, we did test many other configurations including direct connection with an HDMI display, keyboard and mouse and, as one has come to expect, it all "just worked". We'll let others review it as a desktop computer. Our focus here is on its use in industrial and cluster applications. However, one thing that really stands out is the CPU package. It's a "flip chip on silicon" BGA in a heat spreading metal package and the PCB uses a layout designed to disspate heat effectively. In our experience to date, it makes a world of difference! It means this new model can burst up to 1.4GHz and still run effectively without a dedicated CPU heatsink. When we stress tested it we found the PCB warmed up quickly but, and this is important, with the heat spread breadly across the entire board. This is of significant benefit to BitScope users, including those working industrial applications such as edge and cloud computing for IoT with BitScope Blade,and we expect when used in clusters. Now we haven't tried this yet (we only have two beta test units at the moment) but rest assured we will as soon as possible. You'll note from the CPU label it's the same BCM2837 chip inside. That's a key reason reason it remains so highly compatible with the RPi3 in terms of software. Given the higher maximum clock speed it means it's faster, and hotter when pushed, but this seems to be well managed in the kernel and if the board is kept sufficiently ventilated, the RPi3+ PCB design with heavy copper means it does not heat up to the point of causing the governor to kick in and slow down the clock. All this without a dedicated CPU heatsink. And check out those Radios ! Now this is one area where the new model really shines compared to the old, wireless network speed! Under that cute little metal box with the Pi Logo on it is the wireless chip which has been upgraded to the superior Cypress CYW43455 WiFi 802.11n/ac. This 5G chip supports 2.4GHz and 5.GHz WiFi. We measured the bandwidth to be about 3 times faster than RPi3! It also fully supports the usual a/b/g/n rates for backward compatibility with almost any WiFi network on the planet and of course it supports Bluetooth/BLE V4.2 enabling features like frequency hopping to reduce radio interference. The design build into the new Pi comes with modular compliance certification, allowing the board to be designed into third party products with significantly reduced wireless LAN compliance testing, improving both cost and time to market. We think it's the perfect chip to build bespoke home and office wireless access points or for the industrially inclined for IoT edge network routers and gateways especially for monitoring, control, T&M and data acquisition. The Raspberry Pi team have also migrated the highly effective PCB antenna design of Raspberry Pi Zero W to RPi3+ extending the wireless range considerably. We've only just scratched the surface here. Our testing has demonstrated wireless rates of up to 80Mbps between a pair of RPi3+ with one configured as a wireless access point and the other as a client. We're in the process of conducting more tests with a some modern third party of wireless routers to check compatibility but what we're already seen is very impressive. The wired network has a surprise or two in store too ! The network chip has been upgraded to the Microchip LAN7517 which offers full Gigabit Ethernet support. It's also responsible for providing the four USB 2.0 ports on the Pi. They're still USB 2.0 which is an inherent limit of the BCM2837 SoC but for a vast range of applications for which the Raspberry Pi is designed this is rarely a problem. 100BaseT Ethernet has been an issue however and this new model addresses the limitation well by offering a Gigabit compliant interface cabable of running up to about 310Mbps in our testing. So that's not full Gigabit speed but it is 3 times faster than RPi3 and it allows the use of RPi3+ with Gigabit only ports. This is more important than you may think, especially when building clusters with managed switches that don't offer compatible 100BaseT ports! Power Over Ethernet (PoE) is the real kicker in the new Pi for anyone interested in industrial and related applications. It means with an appropriate HAT one can connect a powered network cable and power and connect to the Raspberry Pi via a PoE switch. Think wireless access points, tiny servers or if you're an industrial type, edge routers for IoT setups and you get the idea. With the HAT connected, only one (PoE) cable is required to connect the network and power to the Pi regardless of where it's located. Raspberry Pi Trading is bringing a 48V PoE HAT to market soon to do just this. Of course, we have long supported PoE with BitScope Blade with low cost passive splitters and this remains the case. When used with BitScope Blade, Rpi3+ (and RPi3) can be used with standard PoE sources as shown below. In this case Blade Uno, Raspberry Pi 3 and BitScope CAP are powered via one PoE cable with a splitter. However, we have a new product especially designed for the new Raspberry Pi 3+ which should be available about the same time as the Raspberry Pi PoE HAT. Specifically designed for industrial applications it takes advantage of everything the Raspberry Pi 3+ has to offer including its PoE and high speed networking capabilities. More news about this soon!